Gene writes: Just got a couple of Droid 2 phones and have a Verizon plan. I’m very happy with the phone, it works great, but the cost is probably gonna kill me. Was wondering if you know of any basic plans that might work better; I’d still like to have Internet for me and my son, and unlimited text for sure. Thanks! Greetings, Gene! You’ve hit the nail on the head when it comes to smartphones: it’s the monthly charges, not the up-front price tag, that drain the most money out of your bank account. The main problem is that the big carriers, like Verizon Wireless, all require data plans to go with your new smartphone—and for the most part, those data plans aren’t cheap. 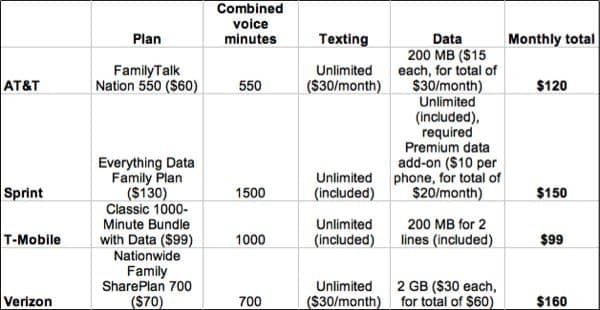 I went ahead and combed through the family plans for the four biggest U.S. wireless carriers—AT&T, Sprint, T-Mobile, and Verizon Wireless—looking for the cheapest deals I could find that include unlimited texting, since that’s one of your must-haves. Of course, you’re probably stuck with Verizon if you signed a two-year service contract, and I’m sure your Motorola Droid 2 phones are locked to Verizon’s network. That said, you may still be able to tweak your plan—and in any case, the details on the other carriers will hopefully help fellow smartphone shoppers who are in the same predicament that you are. AT&T: Yes, you can get a budget smartphone data plan through AT&T. The carrier’s $15-a-month DataPlus option includes 200 MB of monthly data, which might be all you need depending on your smartphone habits. If you exceed your monthly data limit, AT&T will charge you $15 for each additional 200 MB. T-Mobile: The best smartphone deal among all the Big Four wireless carriers offers a generous 1,000 shared voice minutes but just 200 MB for each smartphone line. The catch? If you exceed your 200 MB monthly data allowance, T-Mobile will charge you an overage fee of 10 cents per MB, which comes out to $20 for an additional 200 MB of data. So, Gene—and all you other smartphone shoppers out there—I hope this helps. Have more questions? Leave ’em in the comments below. Note: The smartphone plans I’ve detailed above are current as of 10/5/2011, and they’re bound to change sooner or later.